I’m so excited to share our newest review. I grew up in a household that quoted Dickinson and Frost but I’ve had the hardest time getting my children (especially my sons) to love poetry. 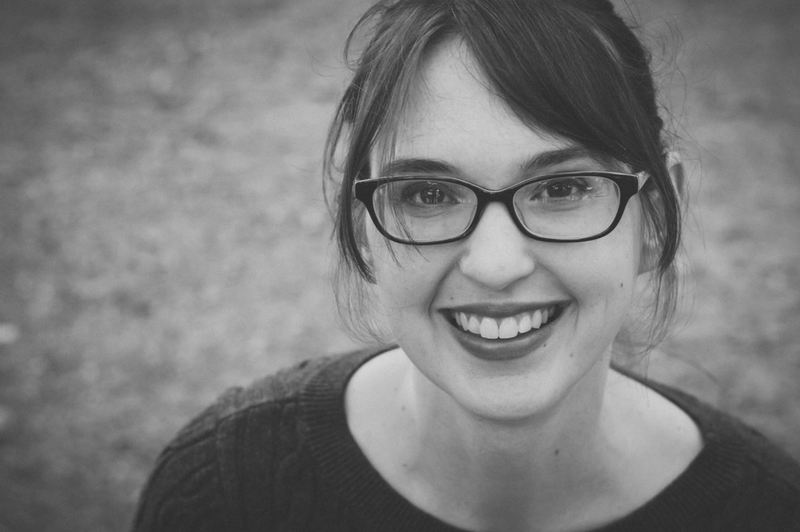 I love writing and love poetry and have been wanting my kids to share my feelings for it. 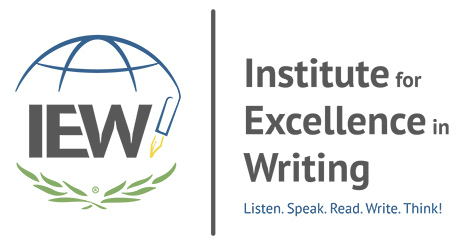 On that note, I should mention that we also love Institute for Excellence in Writing so I was delighted for the opportunity to add Linguistic Development through Poetry Memorization to our daily schedule. 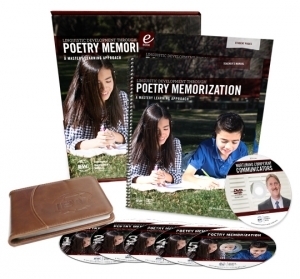 Linguistic Development through Poetry Memorization includes a case of 5 CDs, 7 MP3s, a DVD featuring Andrew Pudewa, an e-book student book and a spiral bound teacher book. We were also provided with the spiral bound Student Book which is available to be purchased for an additional charge. The DVD is simply amazing. I was inspired by watching and listening to Andrew Pudewa, the director of IEW and the creator of the Poetry Memorization program. He talks about the state of language in children in our country. He goes over how children develop their language and vocabulary – delving into some common myths that most of us believe about how to help our children understand and use a higher level of language. 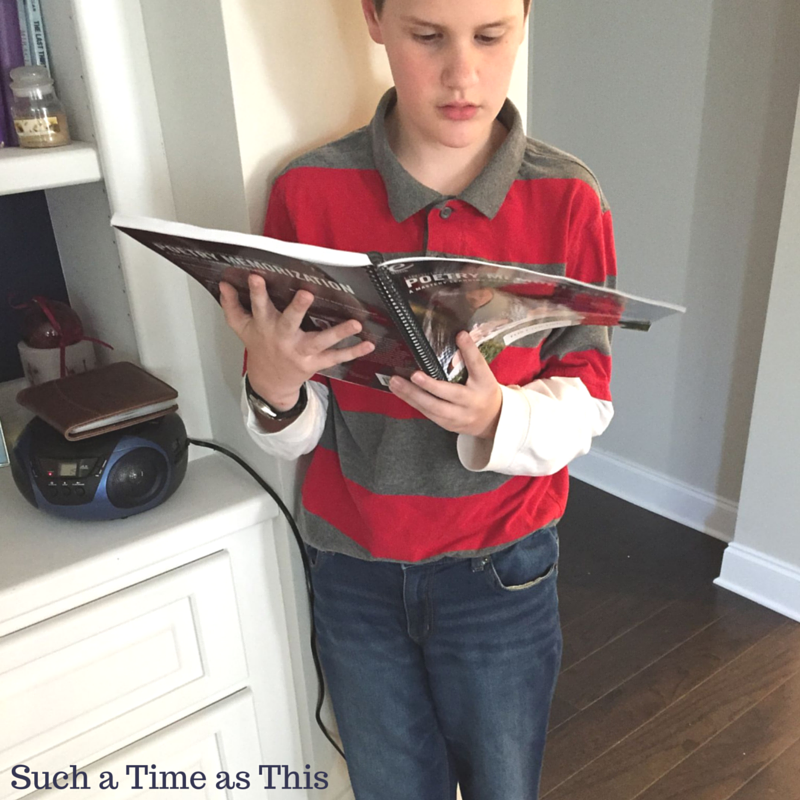 He covers silent reading, reading aloud, television, peers, and memorization. He talks about how memorization actually makes us smarter because of how it affects our brain. He reminds us that no matter how intelligent we are if we haven’t been exposed to great works of literature and language, we can’t pull out what isn’t there. He also talks about how, inorder for most boys to want to memorize poetry, they need something to grab their attention and imagination. He mentions how he has realized that poems with crazy action and ideas which also contain humor in it usually gets boys interested. The whole DVD is a wonderful talk and very informative. The teacher book and the student books are very similar in their content. The major difference is that the teacher book has a different layout and contains some extra information for most of the poems that you might choose to teach to the kids. The student book is written to the student with bigger font and cute pictures on each page. It also contains one poem per page, making it easier for kids to read and learn from (without distractions) whereas the teacher book has several poems listed. Besides extra info on places and setting, the teacher edition also contains highlighted vocabulary words and definitions. The Appendix in the back of the teacher book is a wealth of information. In Appendix 1 all the biographies for every author featured in the book are written. In another section of the Appendix, there are a list of lesson enhancements. These are extra things you can include in the study for each poem. 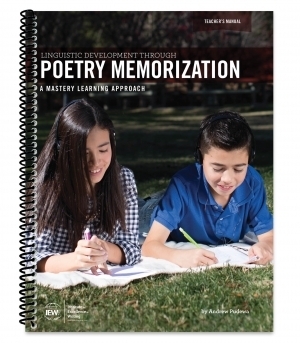 Depending on the poetry, you might be able to add in some science, writing, vocabulary, extra literature, science, music, social studies, and even math. These are all optional and it might be fun to add to the poems that your children are enjoying. The CDs that came with this curriculum contain Andrew Pudewa reading the poems directly to the students. This helps them remember the poems and helps them learn the new one. We started off by gathering all of the kids in the living room and I read the first poem to them. The kids (ages 4-13) loved the poem because it was silly and rhyming and kind of takes a strange turn at the end. I was shocked at how once we were done reciting it for the day, my children decided to act out the poem while reciting it over and over again. My 11-year-old son took the lead and created a little play revolving around the poem with the 4, 5, and 9-year-old. I was blown away by the joy they expressed at learning the first poem. Trust me, I didn’t expect this – especially in association with them memorizing anything. 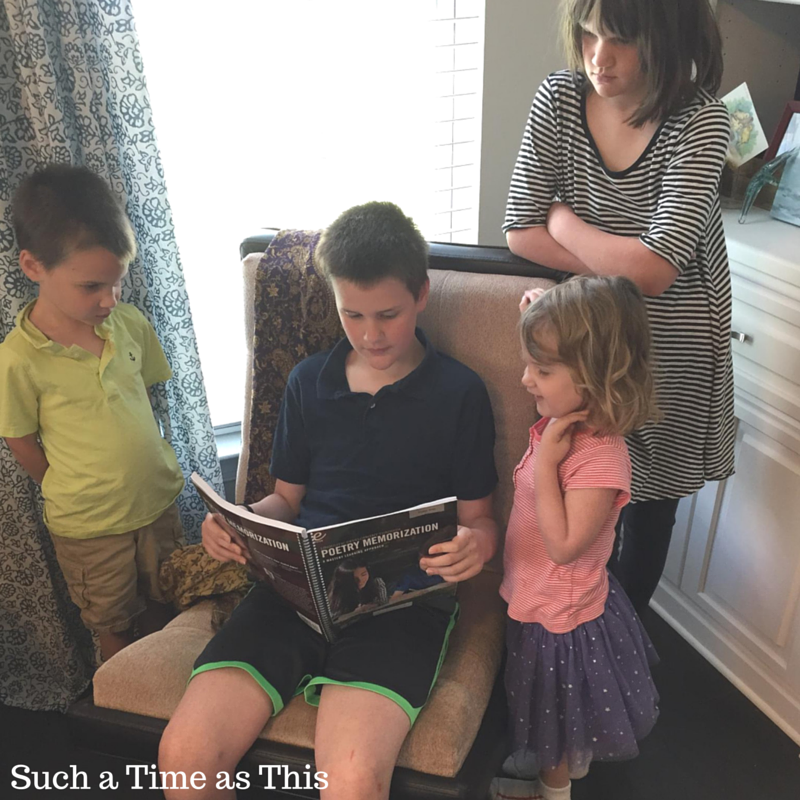 We don’t typically use the classical model of education so at most, my kids memorize short Bible verses but I don’t typically drill memorization with them. I wasn’t expecting them to fall in love with this curriculum. However, they did. After we said the poem the first day, the next day we would listen to it on the CD (read by Andrew Pudewa). I hoped that it would refresh their brain over breakfast. After about 4 days all of the kids had it completely memorized so we moved on to poem two and they quickly learned that one as well as reviewed the first. As we moved on one by one, they were memorizing them (even my little ones were able to say most of the poems precisely). We got to the fifth poem which is exceptionally long compared with the first four and all the kids groaned that they wouldn’t be able to do it. So, I suggested that we go stanza by stanza and just take it a small bite at a time. By the end of our session that morning we had 3/4 of it memorized. I couldn’t believe it and either could they! 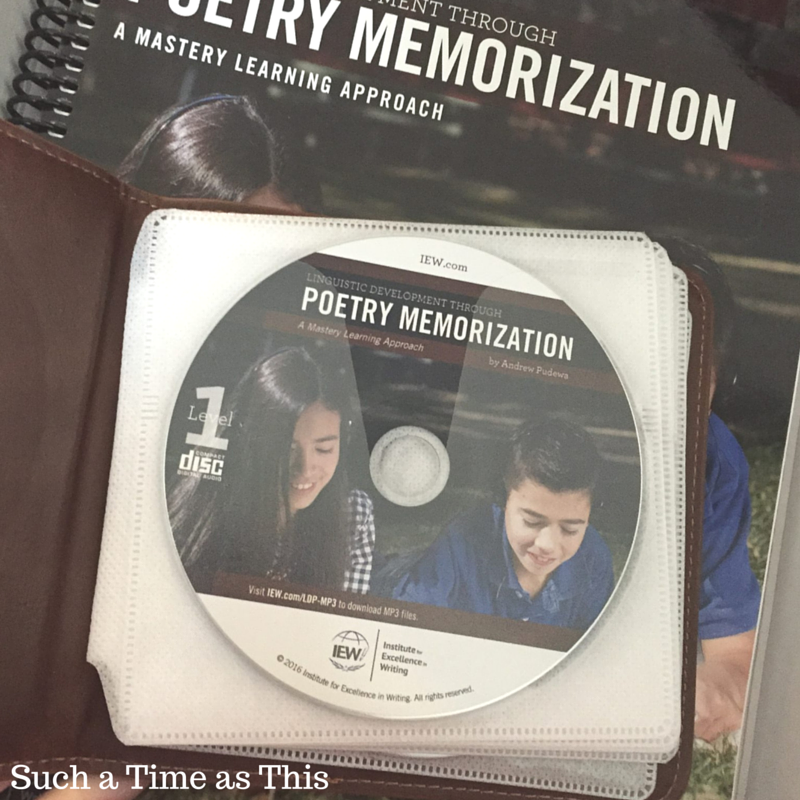 Each time they memorize a poem, I have them review the other poems they have memorized. Each morning we listen to the CD review all the poems and then move on to the next one. Sometimes I let Andrew Pudewa read the poem to us first, and sometimes I read it first. I LOVE this curriculum. I passionately love this. We will continue to use this. Why? There are so many reasons why we will continue but the shortest answers are these: my kids love it and I love it. It is fun for them and I know it is also good for them. I will be honest and tell you that my 13-year-old, who has autism, has struggled more than my other kids, but language is not his strong point. He still participates, it just takes him a little longer to memorize the poems. My four year old has been able to memorize some of it but not all, however, she has a small speech delay, so I am delighted she has done any of it with us. My other three kids have been able to memorize them all. I’m most impressed with my 11-year-old son, who, because of dyslexia, struggles with reading, writing and spelling. His self-confidence has grown as he has memorized these poems and kind of led the others in this endeavor. I can tell that the poems contained in this book were well thought out and chosen with care. All of my children have had so much fun and it has only grown their love of poetry. 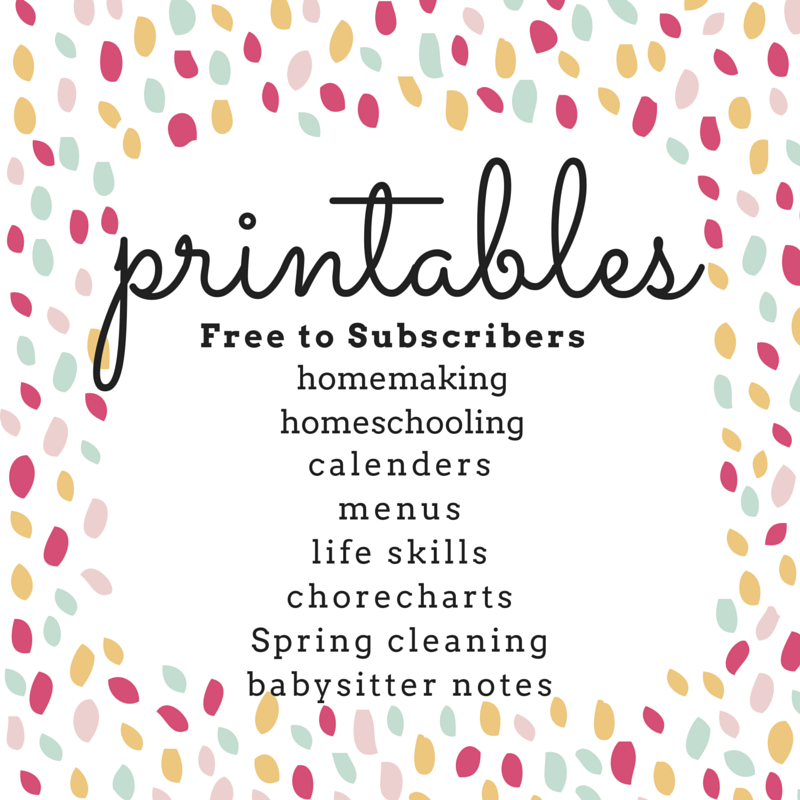 I’m completely impressed with this program and cannot wait to keep using this in our homeschool.